Tottenham right-back Kieran Trippier has withdrawn with a groin injury from the England squad for the upcoming matches against the United States and Croatia. 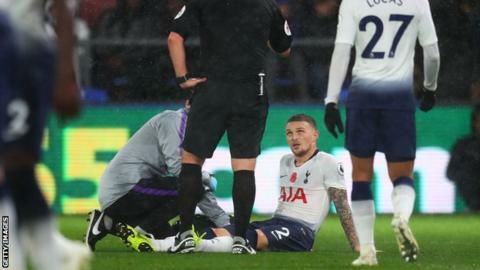 Trippier sustained the injury in the 1-0 win over Crystal Palace on Saturday. He reported to international duty at St. George's Park on Monday but has been sent back to his club. Arsenal striker Danny Welbeck is the only other player to withdraw from Gareth Southgate's 28-man squad. Welbeck has had a second operation on the broken ankle he sustained during Thursday's Europa League draw with Sporting Lisbon. England play the United States in the Wayne Rooney Foundation international on Thursday before hosting Croatia in the Nations League on 18 November.